How do you achieve flawless facial features like the models you see in magazines and on Television? The non-surgical answer is through contouring. The more symmetrically correct your face is the better it looks. Most of us do not have perfect symmetry but the good news is that we can accomplish this through the contouring technique. This technique helps you cheat your way to perfection by enhancing features and minimizing flaws. Contouring is the best magic in makeup right now and in this article I am going to teach you the tips and tricks to help you perform this magic on yourself. STEP #1 – Apply your normal foundation. Tip: Use a Kabuki brush for an airbrush look. STEP #2 – Determine your face shape and visualize what you want to accent or minimize. STEP #3 – Now it is time to COUNTOUR. Let the MAGIC BEGIN! This step is where you can thin out areas you feel is dominating your face. For example, you can thin out your nose by contouring down the sides like shown in the pictures above. Have you always wanted higher cheekbones? 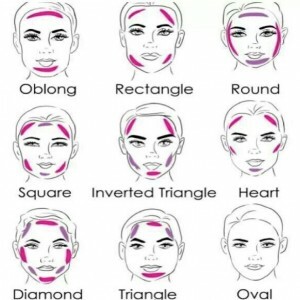 Want no more… contour in hallow of cheeks below your cheekbones and watch your cheeks become immediately chiseled!! TIP: If the color is too dark mix with a lighter powder. To do this dab your contour color and then dab the lighter powder. What you will need: B11 HIGHTLIGHT, B11 WHITE eye shadow and your cream concealer (or foundation stick) that is two shades lighter than you skin. B11 HIGHLIGHT: Finish with applying the B11 HIGHLIGHTER to places that the light naturally hits your face to add dimension and a since of YOUTHFULLNESS. For example: the top of the cheekbone, tip of the nose and center of your chin. Make it your own and do what fits you best. STEP #5 – Apply either the B11 MATTE or SHIMMER blush on cheekbones. Tip: Make the matte a shimmer by mixing in the HIGHTLIGHTER. 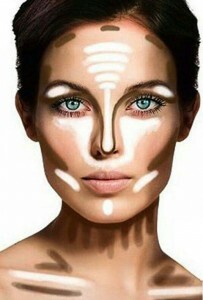 • Highlight the cheekbones, chin and tip of nose with B11 HIGHLIGHTER. • Highlight under the eyes with a concealer that is two shades lighter than you makeup. 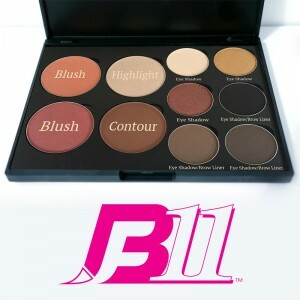 • Contour the hollow of your cheeks with B11 CONTOUR. The holiday season wouldn't be complete without a little holiday baking. However, we all know that traditional holiday baked goods are the enemy of a lean physique, as most are high in sugar and fat and low in fiber. Not exactly a recipe for success. But, rather than simply giving up on ... Read more!